From the moment the starting gun is fired on Kona's sandy beach at the Ironman World Championship, triathletes have 17 hours to cross the finish line. It's a feat marking the ultimate achievement in the sport. 17 Hours to Glory commemorates this dramatic quest with 17 compelling stories that allow readers to experience the competition firsthand. 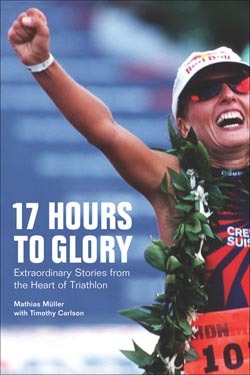 17 Hours to Glory: Extraordinary Stories from the Heart of Triathlon is available now in bookstores, tri shops, and online. These are stories of ordinary and unlikely heroes: 17 Hours to Glory tells the inspiring stories of a sedentary secretary with all the wrong habits taking up triathlon to lose weight, a nun who races to bring attention to her causes, and two men with a rivalry so intense that their disabilities fade into the shadows. Some will become Ironman champions, some will overcome all odds just to finish within 17 hours. All will reveal tremendous athleticism, unbelievable capacity for suffering, and true strength of character. The personal stories of triathlon's most epic characters come to life in this book, beginning with the famous story of Julie Moss's determination to reach the finish line, paving the way for future champions like Mark Allen and Paula Newby-Fraser, and a new generation of superstars in Peter Reid and Chrissie Wellington. Triathlon's most dynamic heroes are candidly portrayed in 17 Hours to Glory, a book that puts no limits on the possibilities of the human spirit. Mathias Müller has competed in seven Ironman races and finished three Ironman World Championship races. His best finish was 99th overall in 9:28 at Ironman® Roth. Müller has written for several German magazines and newspapers for 15 years. Timothy Carlson is among triathlon's most accomplished journalists and photographers. He writes for Inside Triathlon and Triathlete magazines and for Slowtwitch.com. He is co-author of Embedded: The Media Wars in Iraq. VeloPress is an endurance sports and fitness publisher with books on cycling, triathlon, running, swimming, nutrition and diet, yoga, and the histories and personalities of our sports. VeloPress is the book publishing division of Competitor Group, Inc., publisher of VeloNews, Triathlete, Inside Triathlon, and Competitor magazines and producer of the Rock 'N' Roll marathons and half-marathons and the Muddy Buddy adventure series.